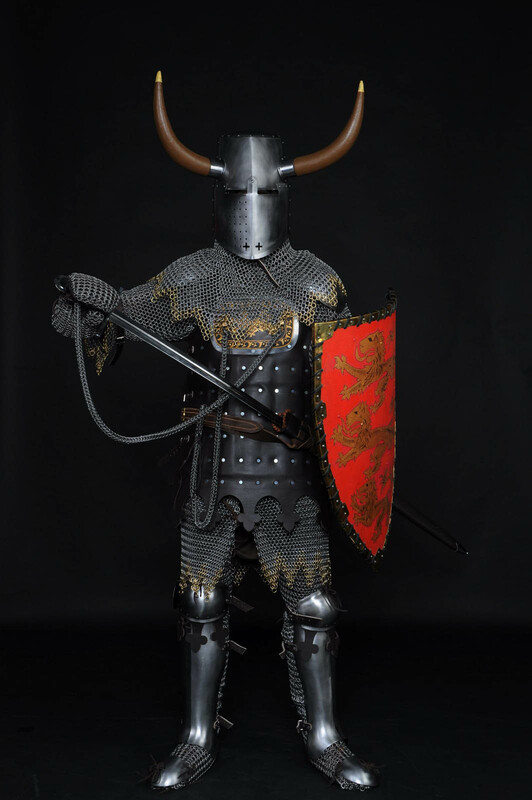 This model of Tophelm – Helmet with horns – is typical for European cavalryman of XIII-XIV centuries. We made horns as top figure of the helmet. Such types of medieval helmet was worn over the mail coif, under what liner with stuffed roller was used. Late topfhelm was often worn over close-fitting skullcap cervelliere that in time evolved in bascinet. Then mail coif was replaced with aventail, that was attached to the under helm (cervelliere or bascinet). 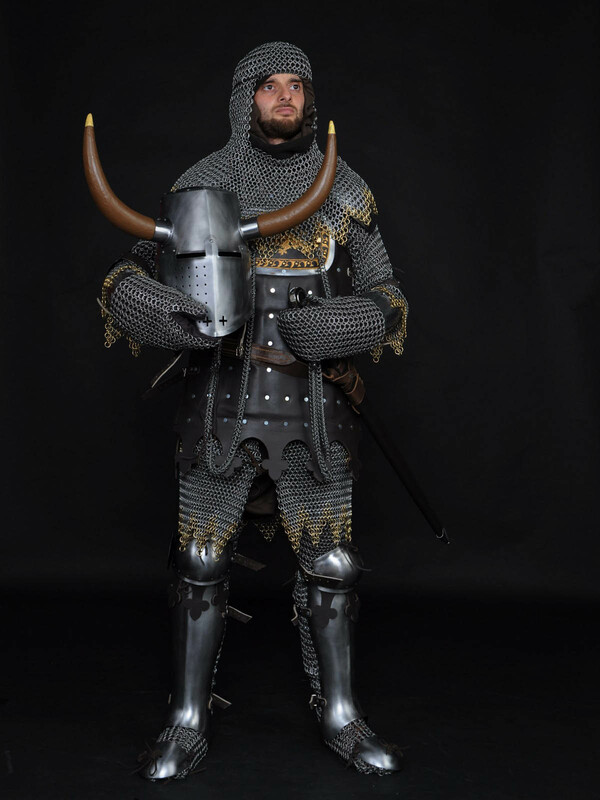 Steel armor of such type was often used as a part of full European knight armor. 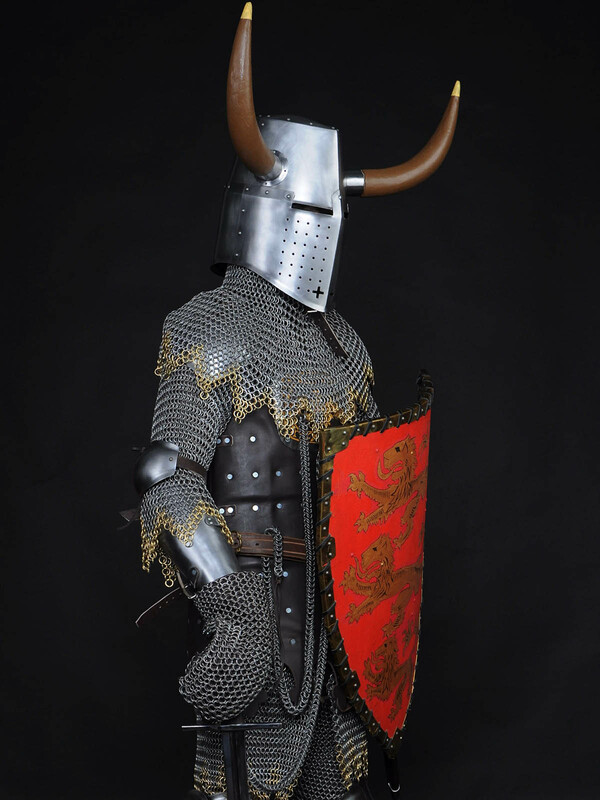 If you are looking for classical Great helms, we offer you to have a look at these models: Great helm, first part of the XIV century; later faceguard Great helm. Helmet Kettle hat (also known as Eisenhut, Chapel-De-Fer, Kettle helm) was favored in XIII-XVI centuries by infantrymen in Europe. Helmets were quite cheap and easy in manufacture, so they were popular among common soldiers. 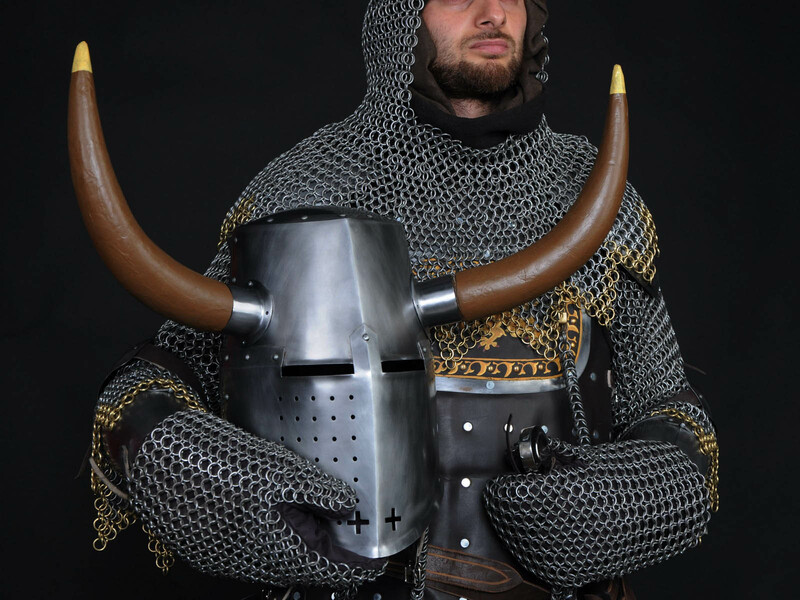 This medieval steel helm got its name because of shape wide-brimmed hat. 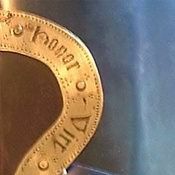 For better protection, kettle hat could be equipped with gorget and was being worn over the padded or mail coif. Also, one of main advantages of such type of head armor was protecting against sun rays. Underchin leather belt with buckle holds helm on your head. You can use this functional handcrafted custom helmet for: SCA HEMA Larp Stage performances Medieval festivals Reenactment events Main photo shows early medieval helmet with following options: Cold-rolled steel 1.5 mm; Satin polishing as finish treatment; Brown leather belt; Steel rivets; Steel nickel-plated buckles Base price includes following options: Cold-rolled steel 1.5 mm; Satin polishing; Brown ..
Helmet bascinet has appeared in the XIV century and was probably even more popular than Chapel-de-fer in the Western Europe and England. Metal cap cervelliere – early and simple version of basinet - was as worn under the Great Helm, so used separately. Both, noble knights and usual infantry used such type of medieval battle helmet. This model of hand-made German bascinet with klappvisor is typical for 1330-1340 years. Klappvisor is a type of visor’s attaching with hinge to the dome. Such attaching allowed a knight to remove a visor and attach nasal plate. Holes and oculars on visor allow great visibility and breathing. This functional helmet is fixed with underchin belt. By your wish, we may install vervelles and leather strip for attaching of mail aventail, with which your neck and shoulders will be additionally protected. 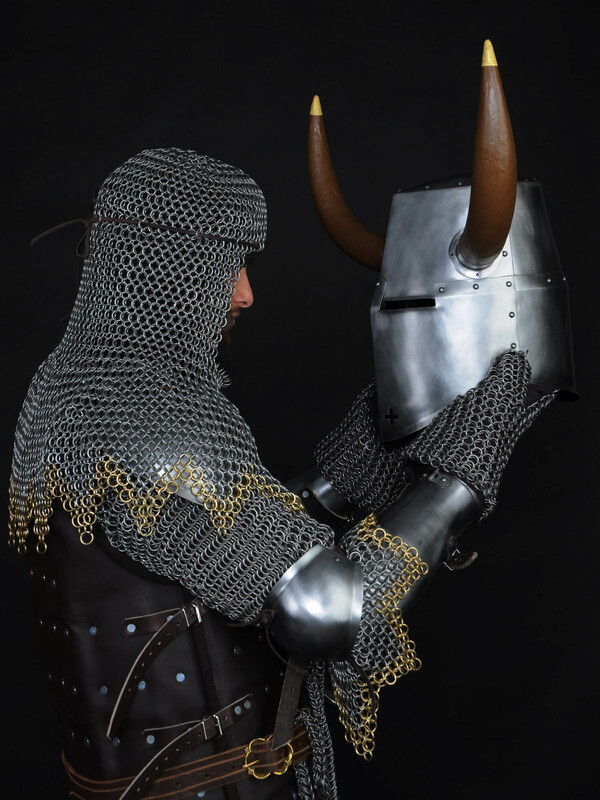 You can use this functional steel helmet bascinet for: SCA HEMA Larp Stage performances Medieval festivals Reenactment events Main photo shows custom medieval helm with following ..
Knight’s plate shoulders of the mid-XV century are made in Italian style. This model is a replica of medieval knight’s articulated spaulders. This defense can be used together with almost any type of body armor. These handcrafted segmented spaulders have rondels, which cover armpits. 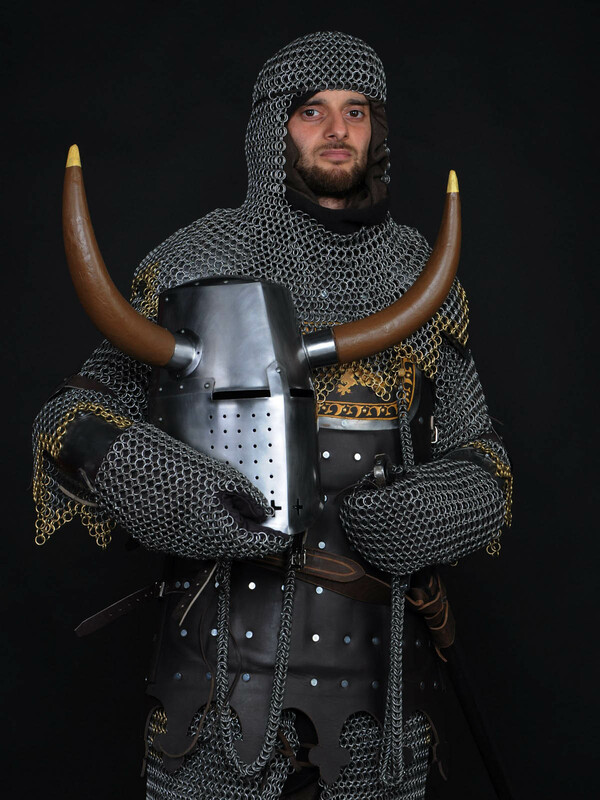 Knight shoulder armor is held with leather belt and buckle on the upper part of arm and is laced to the padded gambeson or breastplate. You can use this functional shoulder armor for: SCA HEMA Larp Stage performances Medieval festivals Reenactment events Base price includes following options: Cold-rolled steel 1.0 mm; Satin polishing; Brown leather belts; Steel nickel-plated buckles; Steel rivets; No decoration; Painting inside Main photo shows medieval knight spaulders with following options: Cold-rolled steel 1.5 mm; Mirror polishing as finish treatment; Steel rivets; Steel buckles; Brown leather; Painting inside In options, you may choose another type and thickness of metal, color o.. The presented bracers are part of Assassin's armour. They are made of waxed leather 3,5-4 mm thick and painted in silver colour. Pattern on the bracers is tooled. Bracers are fixed on the arm with leather belts with brass buckles. Please, contact us at [email protected], if you wish any changes to be made in this model. ..